Matthew Stafford will become the first Detroit Lions quarterback to play in the Pro Bowl since Greg Landry in 1972. Stafford has been announced as an addition to the 2014 Pro Bowl, taking the place of Denver’s Peyton Manning. The Pro Bowl will be played Sunday, Jan. 25 at the University of Phoenix Stadium in Glendale, Ariz. It’s the same site as the Super Bowl which will be played on Feb. 1. Stafford finished the regular season with 4,257 passing yards which is the fifth-most single-season yardage output in franchise history. He now holds four of the Lions’ top five spots on the all-time list for single-season passing yards (5,038 in 2011, 4,967 in 2012, 4,650 in 2013). Also Stafford’s 363 completions rank fifth on the Lions’ all-time list for single-season pass completions. 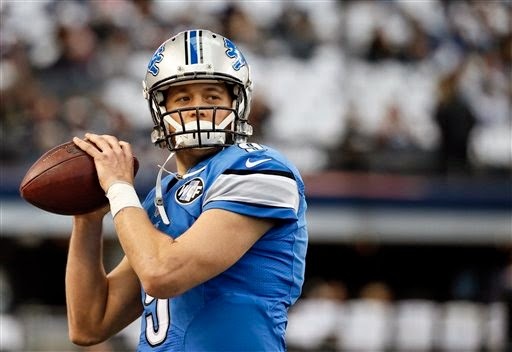 Stafford is only the third Lions quarterback to play in the Pro Bowl. Along with Landry in 1972, Bobby Layne played in it three times — 1953, 1954 and 1957. This is the first time since 2000 that that five Lions have been named to the Pro Bowl. Along with Stafford, Calvin Johnson, Ndamukong Suh and Glover Quin were Pro Bowl selections. On Sunday it was also announced that Golden Tate was added in place of Jeremy Maclin. In 2000. the Lions were represented by linebacker Stephen Boyd, defensive tackle Luther Elliss, kicker Jason Hanson, defensive end Robert Porcher and tight end David Sloan.